NOTES: Sized for 1/48 but applicable for all major scales. Pacific Monograph always seems to come out with interesting things. They do books, accessories and decal sheets of which this is one. 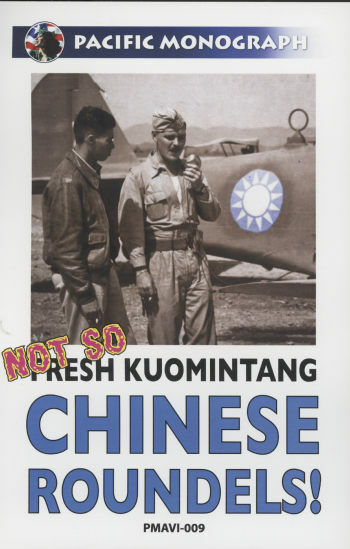 It is the first time I have seen an insignia sheet of these markings and those who model aircraft of the Kuomintang Chinese government will find these particularly useful. These markings have been around since 1911 and the days of Sun Yat-Sen being formalized by Chiang-Kai-Shek and used ever since by t he Nationalist Chinese military. The insignia represents the twelve months of the year and symbolizes progress. 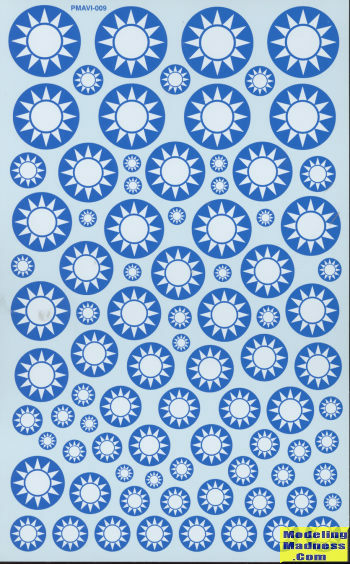 They were widely used during WWII and after and were applied as decals, stencils and even hand painted. This particular sheet provides faded markings in 10 sizes and while it is designed as 1/48 a size chart provided offers references to 1/72 and 1/32 scale as well. It would not be unreasonable for these faded insignia to be on the upper wing and fuselage where UV rays attack the pigments and still have the darker blue ones under the wing, which were mostly out of the direct sun. Well worth picking up, especially if the kit you have does not provide the correct shade you need. Thanks to Pacific Monograph for the review sheet. You can get yours at this link.